Jennie-O markets several styles of turkey breast. Your cooking method will vary somewhat depending on whether you get the oven-ready boneless skinless turkey breast, the oven-ready bone-in turkey breast or the premium basted bone-in turkey breast. All the Jennie-O breasts are pre-seasoned. The oven-ready breasts are intended to ease your workload, as they can go directly from the freezer to the oven without having to defrost them, and they're packaged in a cooking bag that enhances moistness. Cook the premium basted bone-in breast as you would a whole turkey, adjusting the cooking time down a bit for the breast. Defrost the breast overnight in the fridge. Remove the breast from the fridge 30 to 45 minutes before roasting to allow it to warm up to room temperature. Dab the breast with paper towels to dry it. Rub the breast with salt and pepper, if you wish, then rub it with olive oil to prevent the skin from drying out. Place the breast facing down on a cooking rack placed in a roasting pan. Add 1/2 to 1 cup of chicken broth to the roasting pan. Place the roasting pan in the middle of the oven. Roast the breast for about 20 minutes per pound. About half way through cooking, flip the breast so that it faces up. Stick a meat thermometer into the thickest part of the breast to check for doneness. Remove the breast from the oven when it reaches 165 degrees Fahrenheit. Transfer the breast to a cutting board and cover it loosely with foil. Let it rest for 10 minutes before carving. Remove the frozen turkey from the white outer packaging. Don't remove the cooking bag. Place the bagged turkey in a roasting pan with sides that are at least 2 inches high. Cut six 1/2-inch slits in the cooking bag for the bone-in turkey breast. Cut three 1/2 inch slices in the cooking bag for the boneless, skinless turkey breast. Place the roasting pan in the middle of the oven. Allow room so the bag can expand as it heats without touching a rack or the oven walls. Cook a 4- to 7-lb. bone-in breast for 2-3/4 to 3-1/4 hours. Cook a 2- to 3-lb. 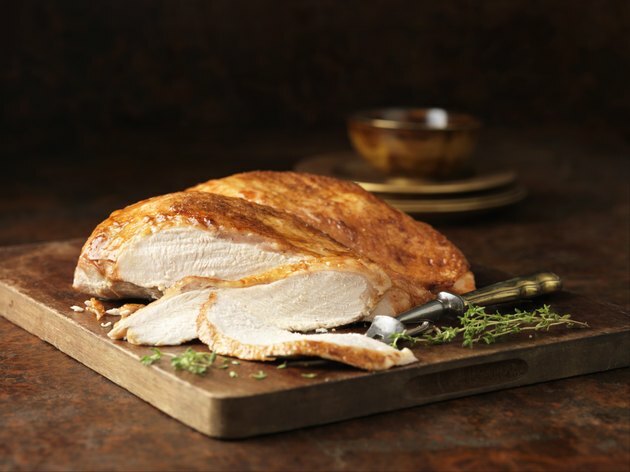 boneless, skinless turkey breast for 1-3/4 to 2-1/4 hours. Check for doneness using a meat thermometer. Remove the breast when it reaches an internal temperature of 170 degrees Fahrenheit. Let the breast rest for 10 minutes in the cooking bag before opening the bag. The interior of the meat rises in temperature quickly during the last hour of cooking. If the meat is close to done, don't let it cook too long without rechecking it.